This collection of historical biographies geared toward 8-14 year olds presents the lives of ordinary people who accomplished extraordinary deeds during the time of the Middle Ages. Illustrated with stunning portraits, this inspiring compilation of stories describes with historical accuracy and age-appropriate content the quality character and unbending determination of St. Patrick, Theodora, Alcuin, Wenceslas, Eleanor of Aquitaine, Joan of Arc, Johann Gutenberg and Martin Luther. Intrigued? 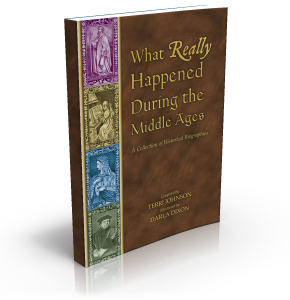 Would you like to read one of the biographies from What Really Happened During the Middle Ages with no obligation what so ever? Click on the button below to receive your free sample biography on one of the historical figures listed above. You will not be asked to enter credit card information as this is our free gift to you. This is an engaging and spiritually rewarding compilation of biographies of fascinating people in the Middle Ages. I learned a lot from this enriching book, and enjoyed not only the stories, but the beautiful maps and illustrations. Get the Kindle e-book here for just $9.99! These books include a total of 33 historical biographies highlighting individuals who impacted our world from the time of creation to the end of the 19th century. Individual titles retail for $15.95 or $18.95. Save over 40% when you purchase all four together.